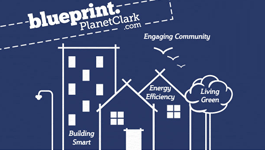 MISSION: Planet Clark was founded to create jobs and support the local community by giving the public easy access to information and resources for embracing energy efficiency, building and remodeling healthy homes, and softening the impact on the environment. GREEN BUILDING STANDARD: In May 2010, the Board of Clark County Commissioners adopted the National Green Building Standard (ICC 700-2008) as the voluntary standard for new residential construction. By encouraging the building sector to look at more sustainable methods and materials for home construction, the commissioners were focused on saving energy, water, and resources; building healthier homes for occupants; and protecting the environment. GRANT: In 2010, with a grant from the Department of Energy under the American Recovery and Reinvestment Act of 2009, Clark County’s Building Safety program launched a duct and home performance program to test, free of charge, the leakage rates of ducts in unconditioned areas as well as the home air infiltration rate of dwellings built prior to 2007. Where duct leakage levels were determined to be high (for example, 10-15 percent or more), homeowners were encouraged to have the air leaks sealed and offered cost estimations for sealing methods, a list of approved contractors, and available incentives through the local utility and applicable rebate programs. Over the two-year program, it was determined that nearly 80 percent of ducts tested in the 750+ homes were leaking, and therefore wasting both energy and dollars. Grateful homeowners took advantage of the available incentives to seal the ducts and save on their energy bills. PARTNERSHIP: Planet Clark is a public-private outreach and education partnership group. It originated as a joint program of three areas in county government: Energy Efficiency Services, Building Safety, and Environmental Services. With the support and contributions of private business partners, Clark Public Utilities, Northwest Natural Gas, and Energy Trust of Oregon, an independent non-profit organization dedicated to helping utility customers benefit from saving energy and generating renewable power, Planet Clark brings a wide range of expertise and resources to the local community that is unparalleled in most outreach programs. 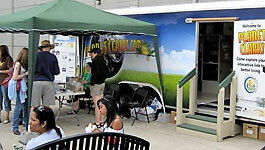 TRAILER: The Planet Clark Demonstration Trailer was fabricated in 2011 with financial and material contributions from more than 20 local contractors and private businesses. It contains interactive displays highlighting HVAC equipment, energy efficiency measures, sustainable building materials, stormwater management, waste reduction, and much more. The trailer has made 50 stops at community venues, including homes shows, the Clark County Fair, neighborhood associations, libraries, and elementary schools in the three seasons it has been on the road. 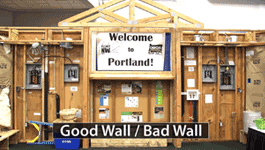 Trained staffers have engaged over 12,000 visitors in discussions about building safety, energy efficiency, green building and remodeling, indoor air quality, recycling, storm water management, sustainable living, water conservation and more. 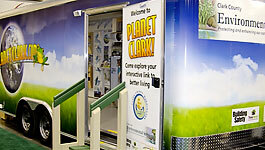 WEBSITE: In 2012, PlanetClark.com was fully updated to make information and resources on all things green and sustainable more easily accessible by homeowners and interested individuals. Don’t hesitate to share the link with your community. On the site are specific ways to save energy and reduce energy bills, how to improve indoor air quality for the health of occupants, weatherization techniques, the elements of green building, and a lot more. OUTREACH: In addition to the demonstration trailer and participation in numerous community events, it is important to get youngsters thinking about the sources and uses of energy and how they can actively participate in saving it. To this end, Planet Clark’s program coordinator, Mike Selig, developed the Energy Detectives program for third through fifth grades. 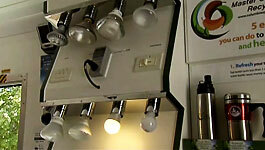 Taking along a hand-crank generator and an infrared camera, Mike’s interactive presentation engages students and, upon completion, offers them status as an Energy Detective with an official certificate and energy saving resources to take home to the family. GREEN HOME: Putting the Sustainability Policy into practice, in 2012 the county elected to partner with a local non-profit, Evergreen Habitat for Humanity, to build a healthy, affordable, energy efficient home. It was designed and engineered to be built to the highest sustainable building standards within the parameters of the available budget, land and resources. For more information, see http://emerald.planetclark.com/. 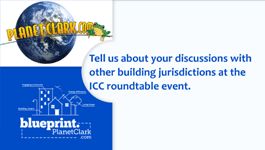 BLUEPRINT: To expand on the ICC Raising the Profile award received in 2011, Clark County’s Building Safety program has created this website specifically for building officials. The culmination of the past two years of research and innovation, the site contains information and resources for the myriad aspects of green building and healthy homes. As building officials, we really can do more for our communities!